Collaboration is more than an activity. In the contemporary online learning environment, collaboration needs to be conceived as an overarching way of learning that fosters continued knowledge building. For this to occur, design of a learning task goes beyond students working together. There are integral nuances that give rise to: how the task is designed, how the task is scaffolded and facilitated, and how students are prepared to work within a collaborative framework. Through a review of the literature, the purpose of this paper is three-fold: 1) to identify and discuss four common assumptions that restrict or impede collaboration in the online environment; 2) to share practices in how to design, facilitate and assess, and to prepare students for collaborative learning in online environments; and 3) to examine implications for practice in relation to institutional supports, educational development for instructors, and student preparation. The goal of the paper is to inform the design and facilitation practice for online collaborative learning to be strategically woven into the tapestry of knowledge building learning environments. Lock, J. & Johnson, C. (2017). From Assumptions to Practice: Creating and Supporting Robust Online Collaborative Learning. 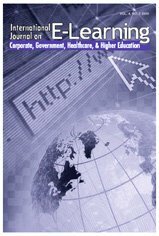 International Journal on E-Learning, 16 (1), 47-66. Waynesville, NC USA: Association for the Advancement of Computing in Education (AACE). Retrieved April 25, 2019 from https://www.learntechlib.org/primary/p/149119/.